Chris Polk, a Tax Consultant, is a Certified Public Accountant working in the firm’s corporate tax practice. 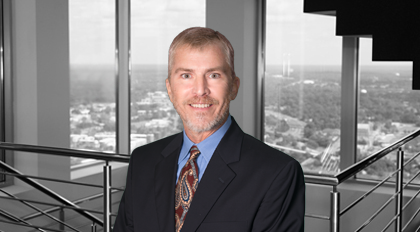 His work includes state and local tax incentives, sales and use tax, Internal Revenue Service and state tax audit support, mergers and acquisitions, tax research, classification and treatment of fixed assets and research and development credits. Polk began his career in private industry and has held various positions with both publicly traded and closely held companies. He has over 15 years experience in tax consulting. Prior to joining Moore & Van Allen, he was a tax consultant in private practice. His background covers a broad range of tax services including tax accounting, federal, state and international tax compliance, consolidated groups, international taxation, inventory capitalization, property tax, Internal Revenue Service and state audit support, process improvement and software selection and implementation. Industry experience includes banking, manufacturing and airline transportation. His non-tax experience includes work as an auditor and comptroller in industry.